We import cork tiles and cork products from Spain and Portugal and we are leading suppliers to the flooring trade, DIY stores and industry throughout the UK since 1968. We are members of the UK Cork Industry Federation and all our products are supplied to their high standards. All our phones are answered personally and we only supply goods we import ourselves. We are therefore able to advise our customers on the most suitable product for their particular installation. 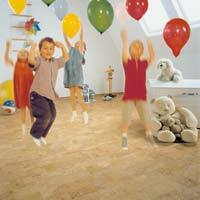 Cork tiles are resilient and insulating against sound or heat loss. They are ideal for all domestic areas including the bathroom. For commercial areas, our tiles with extra harder wearing surfaces (Wicanders HPS) are very suitable. Our range of cork tiles is probably the largest in the UK. Our basic cork tiles compete with any of the DIY superstores but are probably better quality than most. Our range includes heavy density cork tiles for libraries, universities, museums and other traditional types of installations with tiles up to 8.00mm thick. These tiles are all available to you if this is what your installation needs. Our ‘Siesta’ waxed floor tiles are frequently used by allergy sufferers as they are finished with a natural wax. Cork wall tiles can be decorative or functional, e.g. noticeboard areas or insulation – heat or sound. We have ‘Pinpanel’, self-adhesive for small memoboard areas. The cork factories in Iberia have been increasing the quality over many years and tiles are now made to very exacting standards on modern sophisticated machinery that give a perfect product – perfect dimensionally and perfect finishment. All the components used to manufacture our cork porducts are completely non-toxic and cork itself is a very healthy product – just as timber is. So cork is not just a totally enviromentally sustainable material, it also makes an excellent flooring or wall covering product that gives a wonderful ambience to any room, warm and resilient with excellant sound and thermal properties. Do you have a room that would benefit from this? We could probably offer slightly cheaper products in some instances but our policy is not to compromise basic quality so our customers can always buy in full confidence. Quite often we are complimented on the excellent quality particularly by persons who have previously tried cheaper products from other suppliers. Please visit our page with some ‘testimonials’ we have received. All our cork suppliers have to conform to Health & Safety regulations of the European Union. We have nothing made in far eastern countries and our products carbon footprint is only 1,400 miles from Portugal. We are not a retail establishment and therefore we can only supply by mail order. However tiles can be collected but only by arrangement. As well as our own ranges we are a main distributor for Wicanders (Amorin) products to trade or retail. Some products ex-stock. Free delivery on orders over £60 inc VAT or just £13.00 delivery on orders under £60 inc VAT. For off UK mainland – please enquire for extra costs. Our service is much appreciated by those living away from towns or persons who are not able to purchase their exact requirements locally. Most goods are ex-stock. Delivery is 3-4 days by national carriers or NEXT DAY at a minimum cost of £20. When paying by CREDIT CARD delivery can only be to the card holders’ registered address unless we have an email to confirm an alternative address, otherwise just send a cheque. We cannot offer COD. Please note, we do not take payments via the internet as ours is not a secure site. If you want to save time please email us your detailed order, complete with the address of the card holder (with delivery address if appropriate) and a contact phone number and we will call you for your debit/credit card details to complete the transaction. We do not take payment from your credit card until goods are ready for despatch. We have been supplying cork tiles by mail order for over 30 years and receive many compliments on our service right from the first contact through to delivery. To obtain a detailed price list, brochure, small samples and technical information or a local stockist, contact us now and give us your postal address.